The co-founder of Death Row Records ran over two bystanders as he tried to flee a fight on a film set in Compton, according to his attorney. LOS ANGELES POLICE Los Angeles police say rap mogul Marion “Suge” Knight is a “person of interest” in a hit-and-run in Los Angeles on Thursday that left one man dead and another person in the hospital. Los Angeles County Sheriff’s Department spokeswoman Trina Schrader said Knight was a “person of interest” in the case but gave no other details. The co-founder of Death Row Records ran over two bystanders as he tried to flee a fight on a film set in the city of Compton in southern Los Angeles, Knight’s attorney James Blatt told Entertainment Weekly. Los Angeles County Sheriff’s Deputy Ryan Rouzan told AFP there was a fatal traffic collision at 2:55 pm (10.55pm Irish time), leaving one man dead and another person in the hospital. Lt. John Corina of the Los Angeles County Sheriff’s Department detective’s unit said authorities were treating the case as a homicide, the Los Angeles Times reported. Ice Cube posted a picture on his Instagram account earlier yesterday saying that he was filming a commercial in Compton. 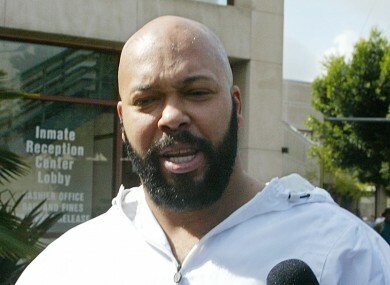 Email “Suge Knight 'person of interest' after man killed in hit-and-run”. Feedback on “Suge Knight 'person of interest' after man killed in hit-and-run”.